Watershed investment programs can reduce the costs of managing water while delivering community benefits but they’re underused because mobilizing support is difficult and funding can be hard to come by. The World Resources Institute is attempting to ease the burden with a new one-stop resource that offers detailed guidance on what it takes to create a successful watershed investment program. 28 October 2016 | In the United States, news about impaired drinking water sources makes regular headlines. Mountain snowpack doesn’t replenish reservoirs as much as municipalities and state officials across the US West hope. Pollution running off farm fields leads to toxic algae blooms in Lake Erie and spoils a region’s drinking water. Dangerously high levels of lead in Flint, Michigan’s water supply create a public health crisis. Additionally, wildfire, deforestation, urban development and climate change exacerbate risks to a city’s water. While incorporating nature into water management in a more central way won’t solve all of these challenges, some water practitioners say investing in watersheds will indeed lead to a safer and secure supply of water for urban areas. New York City brought some attention to the watershed investment space with its relatively widely-known program. Denver established one in 2010 and four other Colorado cities followed in short order. However, only a few dozen watershed investment programs exist throughout the US, according to the World Resources Institute (WRI). A big part of that is because there is little knowledge-sharing going on between regions and programs in this space, and developing a watershed investment program is challenging. It involves attracting investors and engaging with the multiple stakeholders within a watershed. But the water utilities and municipalities involved are, for the most part, unable to build off of each other experiences and successes. Three years ago, WRI set out to change that by performing a comparative analysis of 13 watershed investment programs in the country. 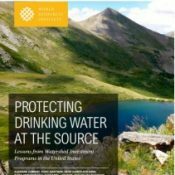 And on October 27, they published their findings in a paper titled, Protecting Drinking Water at the Source: Lessons from Watershed Investment Programs in the United States. The paper focuses on 10 key factors that guide successful program development so that newcomers to the space don’t have to reinvent the wheel. The goal was to gather intelligence from existing programs, along with tangible examples to be applied to different localities, as a one-stop resource on this critical topic, report authors, Suzanne Ozment and Todd Gartner wrote in a new blog post. WRI’s new report draws data from Ecosystem Marketplace’s global State of Watershed Investments 2014 report, which is soon to be updated by a 2016 version. Preliminary findings are already revealing a major uptick in activity, identifying at least 95 initiatives in the US funneling some USD 3.8 billion into watershed conservation. According to the American Water Works Association, water infrastructure in the US is in a state of disrepair, and will require $1 trillion to repair, maintain and expand. In order for this water infrastructure to function at the most effective level, authors of the WRI report say water users must make additional investments in natural infrastructure, the forests and wetlands that help sustain water flows. These ecosystems filter impurities in waterways, reduce sedimentation, regulate water flows and house biodiversity among other benefits. Moreover, healthy forests reduce the amount of funds cities need to treat their water to ensure it’s safe to drink. According to the report, seven US cities saved between $725,000 and $300 million in annual water treatment costs through investments in nature. Watershed investment programs essentially conserve and restore upstream forest ecosystems that watersheds flow through. As downstream users such as water utilities, municipal governments, businesses and the public benefit from forest restoration activities, they in turn finance the conservation activities through a variety of funding mechanisms. These programs vary in size, model and sometimes in name but all seek to secure clean water by sustainably managing watersheds. Colorado started utilizing this approach after a few wildfires tore through its forests dumping massive amounts of sediment into watersheds critical to Denver and other cities’ water supply. “The forest to faucet connection is tightly linked in Colorado,” says Heidi Huber-Stearns, a faculty Research Associate at the University of Oregon’s Institute for a Sustainable Environment. Huber-Stearns was also involved in WRI’s new report as her dissertation, which she completed in the Department of Forest and Rangeland Stewardship at Colorado State University, informed it. She notes the communities residing in Colorado’s foothills have been deeply affected by fire and floods. They have a fire in their backyard and then see a river that they know is a city’s drinking supply run black, Huber-Stearns explains. It creates a tight connection. Denver’s program, which involves a partnership with the US Forest Service, has resulted in nearly 40,000 acres treated to reduce wildfire risk and restore burned acres in critical watersheds. And the programs that followed in other cities are modeled after Denver’s and involve the same network of practitioners. Back east, Raleigh, North Carolina, teamed up with the Conservation Trust of North Carolina to set up the Upper Neuse Clean Water Initiative, which essentially acquires land or works with private landowners to practice sustainable forestry. Unlike the US West, much of the forestland located in the eastern part of the country is privately owned. The Upper Neuse River Basin supplies eight municipalities with their drinking water but the waterway is plagued with algae blooms and nutrient pollution. Between 2006 and 2015, report authors say the watershed investment initiative led to the protection of 84 miles of stream bank across nearly 7,700 acres. Despite these success stories, a close look at watershed investment programs illuminates a host of barriers for program developers. Ecosystem Marketplace’s State of Watershed Investment 2014 report notes several of the primary challenges, which include a lack of buyers (investors) for watershed services that support clean water, difficulty raising initial capital, regulatory uncertainty and disinterest among landowners that would be supplying the watershed services. The WRI report recognizes the difficulties programs have in securing capital and investors while also identifying the innovative finance measures meant to help fill the finance gap. For instance, specialized green bonds to finance urban water infrastructure needs are gaining traction. Late last month, Washington D.C.’s water utility issued the US’ first green bond intended to finance green infrastructure, which will help manage the city’s massive stormwater runoff. The challenges are big but report authors say knowledge sharing, such as the concepts put forth in this report, can have a significant impact in terms of addressing challenges. “It can be difficult to strike the right balance between synthesizing lessons learned in this space in a way that is broadly applicable but also still specific enough so that it’s helpful for folks to use in their own area, and I think this report does it pretty well,” says Huber-Stearns. As for the challenge of regulatory uncertainty, the government has been addressing it with new policies enabling investments in nature. These include the Forest Service’s revised planning rule in 2012, which seeks to better value ecosystem services, and a 2015 Presidential Memorandum that instructed federal agencies to integrate natural infrastructure into their decision-making. More recently, California’s governor and lawmakers recognized several of the state’s watersheds as infrastructure. Plus, the private sector appears to be stepping up – albeit slowly. Ecosystem Marketplace’s report from 2014 on watershed investments found companies such as Coca Cola and SAB Miller going the extra mile to protect their water supply by engaging with other users in a watershed and using it sustainably. Watershed investment programs can save water sources businesses – and communities – need to sustain their operations, Ozment and Gartner write. And in the process, they also save lives, reduce infrastructure costs and protect human health.